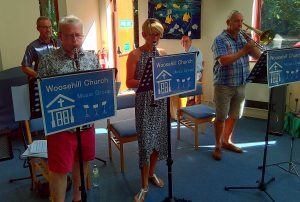 Woosehill Community Church has an enthusiastic music group, who help lead us in worship on Sunday mornings. We often practise on Sunday mornings at 9am in the church. Our current membership includes guitars (electric and acoustic), clarinets, saxophone, trombone, cello, keyboard (piano & organ), accordion and Latin percussion. We play a wide variety of music from the Victorian hymn writers to contemporary worship songs. We play at most main Sunday services, and also support the services at Suffolk Lodge nursing home. The music group is hard work, but also great fun and very rewarding, with a wonderful team spirit. It offers an opportunity for playing regularly, as well as fellowship with other members of the band. If you would like to find out more, or to join us – please contact us and we’ll put you in touch with Mike.